a wide variety of styles and price points available. Our Jackson Showroom serves all of Wyoming as well as Teton County, Idaho. The Village Center because I’m really excited to be working on a hospitality project. I am enjoying the challenges that come with a commercial project. Describe your process – how do you work with clients, contractors designers, and architects? I work with the clients, contractors, designers, and architects to choose the hardware style and function that best suits the design of the house. In some cases the architect brings the client in and in others, the designer will bring them in. Occasionally, the homeowners come in and I take them through the showroom; I help them choose the style of hardware that they like. I also look at the floor plans for their project and develop a hardware schedule. When they are ready to order the hardware, I go out to the job and walk all of the doors to verify details and functions. This is hard because I love everything that Rocky Mountain Hardware makes, but if I had to choose just one, I would have to say our barn door track. It is solid cast bronze, and it is available in all 10 of our finishes. We are seeing more homes with barn doors, so it is nice to be able to carry the finish of the door hardware throughout the entire project. I like all of the different people I have gotten to work with and the beautiful homes we help finish. I enjoy helping them choose the hardware that really compliments the design of their project. If you think about it, the hardware is the part of your home that you handle every day. A friend of mine once said that the hardware is the jewelry of the home. I was helping out a friend who is a horse trainer, and one of her clients told me about a job opening at Rocky Mountain Hardware. I was looking to do something different than the welding shop I was currently working at, so I applied. I spent two years working the front desk and getting familiar with the products. When the opportunity came up to become a sales rep, I took it. I have been here seven years now, and I love working here as much now as when I started. Rocky Mountain Hardware offers great products, and I couldn’t ask for a better company to work for. I can’t really narrow it down to just one. I spend a lot of my free time around horses. I mostly ride English and enjoying jumping. To be honest, I even love just grooming and taking care of the horses. My other favorite activity is going to truck and tractor pulls. While I like all of the classes except the stock gas—they just do not have enough horsepower to make it interesting. My favorite class is the Pro Farm Tractors. If you could own any three “toys” what would they be? We already have a ’72 Chevelle Mailbu that we are rebuilding with an LS6 Corvette motor, but I would really like a ’66 Chevelle Super Sport. I just love the body style of the ’66. A sport ATV would be next on the list, specifically the Yamaha YFZ450. These are just so much fun in the dunes. And a tractor. I don’t know why, but I just love tractors. I don’t care if it is a mini excavator, a skid steer, a backhoe, or a farm tractor. 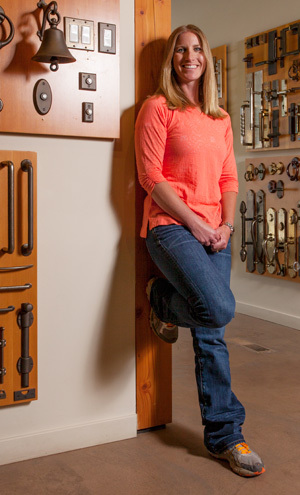 Rocky Mountain Hardware, a family owned, Idaho-based company, is internationally known for manufacturing exceptional, solid bronze hardware and accessories. Each piece is available in a choice of 10 hand-applied patina finishes and contains at least 90% recycled material, 50% of which is post consumer. With thousands of products in our mainline, from door hardware to cabinet knobs, robe hooks to window cranks, decorative tiles to hinges, Rocky Mountain Hardware complements a broad range of architectural styles and needs. Their Jackson showroom, which is one of two company-owned stores, not only carries Rocky Mountain Hardware, but also other brands and products that meet their high standards and can suit any budget or style.